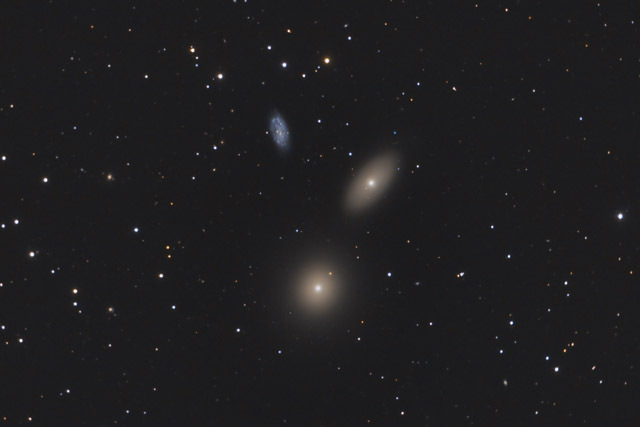 This image shows a trio of galaxies, two of which are part of the Leo I Galaxy Group and one of which lines up by chance with the other galaxies. The large elliptical galaxy at the bottom is M105, which is a dominant member of the Leo I group as well as the nearest elliptical galaxy to us. The lenticular galaxy above M105 is NGC 3384. It, too, is a member of the Leo I group along with the other notable galaxies in the group, M95 and M96 (not shown). The spiral galaxy at the top is NGC 3389. Whlie it appears to be a group member, it is actually at twice the distance of M105 and NGC 3384. As such, it is not one of the cluster members. In this photo, North is to the right. This image is cropped to 60% of the original full frame. Software Used Images Plus 5.0 for camera control, calibration, stacking, digital development, star shrinking, smoothing and noise reduction, advanced Lucy-Richardson deconvolution, and multiresolution sharpening. Photoshop CS5 used for levels and curves, high pass filter, star shrinking, screen mask invert, lab color, saturation adjustments, selective color. Gradient Xterminator for gradient removal. Carboni Tools for additional noise reduction, and smoothing. HLVG for additional color correction. Registar for aligning stacks and composites and for color channel alignment. Focus Magic for focus restoration. Notes While this isn't the most exciting field of view, I was happy with the details I was able to capture in NGC 3389. There's also some nice background galaxies in the images, which adds a bit to its appeal.